Some methods for securing evidence are explained below; these are currently used in laboratories. During the investigation of objects of evidence, the surfaces are distinguished between porous (such as paper, cardboard, cloth) and non-porous (such as glass, metal, plastics). The investigation methods must be different because in non-porous objects of evidence fingerprint substance remains on the surface, whereas the substance penetrates inside the material of porous surfaces. An important method for visualizing fingerprints on non-porous surfaces is the cyanoacrylate vapor deposition. Here, Cyanoacrylate (also used as adhesive for example) is heated and thereby vaporized. In a closed environment, (for example a vapor deposition chamber) the vaporized adhesive is brought together with the examined objects of evidence. Through an increase of the humidity in the deposition chamber, the cyanoacrylate vapor reacts with the moisture of the fingerprints and polymerizes. This produces long-chain molecules, which can be seen with the naked eye as a white precipitate. Through selective deposition of the cyanoacrylate on the finger marks, this method is suitable for visualizing fingerprints. Further treatment of the found tracks is possible by means of various powders or by bathing the objects of evidence in colored solutions. 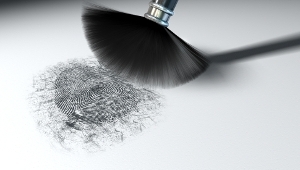 Other important methods for securing fingerprints on non-porous surfaces are, for example, the use of magnetic or fluorescent powder, carbon black powder, adhesive tapes or gel sheets. The use of different powders depends on the area of application. Thus, a fluorescent powder, for example, is best suitable if distracting backgrounds or patterns make the use of ordinary powder (e.g. carbon black powder) impossible. To secure the evidence treated with powder, it is subsequently photographed (possibly using external light sources such as UV). For securing fingerprints on porous surfaces liquid chemicals are used for the most part, that penetrate the material and react with the fingerprint components. Important examples include DFO (1.8-diazafluor-9-one) and ninhydrin. Both chemicals are particularly used for the treatment of evidence made of paper. During the treatment of evidence objects, they are bathed in the chemical or sprayed using a spray bottle. Both chemicals react with the amino acids in the sweat, which is a part of the finger trace. This results in a color reaction in each case. When using ninhydrin, the reaction is accelerated by the application of heat which results in a dark purple to black color. The coloration after treatment with ninhydrin is only visible under UV light. All traditional methods for securing fingerprints have in common that they are invasive and time consuming. The materials used are partially hazardous. These disadvantages can be circumvented by the use of EVISCAN as it searches and secures fingerprints in minutes, without chemicals or pre-treatments and is therefore non-invasive.